Depending on who you ask, either we are all being slowly rotted from the inside out by the chemicals and junk we consume OR our bodies are so perfectly efficient at removing toxins that detoxes and cleanses are a bunch of gimmicky rubbish. The truth? Somewhere in the middle. Even if you are typically a “clean eater” or do a #plantbased diet, you can benefit from a short-term detox plan — so long as your what, when and why are aligned. Three-day-weekend-booze binges, pizza pig-outs, and Splenda-laced-coffee chugging can all cause inflammation, which leads to a whole host of other gnarly stuff including cancer, obesity, and just plain blah feelings. A detox — while not a magical cure-all — can be a great way to reset your body, break bad habits, and get back to feeling your best… until the next three-day weekend that is. So what exactly is a detox? They come in all different packages and price points, but for the sake of this article, a detox diet is a short-term eating plan that removes some or all ingestible ingredients that can be seen as “toxic”. Depending on what your baseline is, just removing meat and dairy could be considered a detox — and feel super intense. Juice cleanses — which were all the rage a few years ago — require that you only consume juice for a period of 24 hours or more. These juice “fasts”, as they are often called, are as much mental as they are physical. While you might still be slurping down a decent number of calories, the sheer lack of chewing alone is enough to make some of us lose it. The Sakara Level II Detox, which I completed just last week, takes a more scientific approach. Designed by Dr. Aviva Romm, this detox is designed to reset the gut microbiome and remove any potentially inflammatory agents: meat, dairy, gluten, all sugar (including fruit), nuts, soy, nightshades, pesticides, harmful chemicals, GMOs, toxins, alcohol, and caffeine. Is it intense? Hell yes! Is it effective? Also, hell yes! On my worst day, my one coffee-a-day habit can quickly become three, and two glasses of wine with dinner can easily become two bottles (don’t judge). And don’t forget all the bread, cheese, and chocolate that comes with all that wine (yaaaass). Let’s just say that I had gotten a little out of control. Was I eating because I was hungry? Did all that rich food actually taste that good? Who could even tell anymore? I was feeling bloated and sluggish, and to be honest, a bit depressed. With this particular detox I knew I was getting all of the good (greens, healthy fats, supplement, and fluids) and none of that other bad sh*t (see list above). And once I survived day four which is ONLY liquids, my break-fast breakfast on Friday — though, still nothing more than well-prepared organic vegetables — felt incredibly indulgent and filling. In other words… I had reset my appetite, my taste buds, AND my gut. The two main factors you want to consider when scheduling a cleanse are picking a time when you 1) aren’t busy AF and 2) you give AF about completing it. Does your BFF’s B-day dinner fall on day three of your five-day cleanse? Do you have a massive presentation during day two that will require extreme mental focus and stress you out until it’s complete? Both sound like perfectly valid reasons to quit. Our brains are far weaker than our bodies. Are we actually starving? Nope! But we’re pampered creatures who “can’t even” live without our 3 pm slump snack, let alone a full week of asceticism. Pick a week where you don’t have too much on your plate to not, um, put too much on your plate or you’re setting yourself up for failure. Another great time to cleanse is when you have a partner in misery — er, crime. The buddy system is especially effective if your buddy is of the “type A” variety, and will peer pressure you into finishing it with them. Disclaimer: do not agree to detox with your drinking buddy who will inevitably say, “Screw it, it’s #tacotuesday,” and knock you off course. Not today, Satan. And there’s one more very um, “regular” time to do a detox. Yes, I’m gonna go there because we’ve all been there. Maybe you come back from a tropical trip feeling backed up and icky or your yoga retreat in India left you afraid to be more than a few steps away from the loo. Or if your belly suddenly looks 3 months pregnant even though you haven’t skipped a pill. It happens to the healthiest among us and if you are not eliminating once per day (that would be #2) then you’re likely suffering from gut issues that could easily be cleared up by a brief detox. Skip the Pepto Bismol and laxatives and heal your belly in a more holistic way. Just make sure you’ve chosen a cleanse that includes probiotics or you’ll end up in a worse state than the one you started in. Though what cleanse you pick and when you schedule it are important, the reason why you’re cleansing is the most important piece of the pie (sorry for mentioning pie in an article about detoxing, btw). A detox can be used when you’re at rock bottom (broken out, not pooping, bloated, etc.) but it’s most powerful when you’re ready to truly honor your body and reap the health benefits associated with eating in accordance with that ethos: When you’re not just thinking about the numbers on the scale dipping low or your booty looking fly for the ‘gram. When you realize that your habits are controlling you — caffeine; white wine; Levain cookies; or, you know, pick your poison — rather than YOU controlling them. I’m a firm believer in “all things in moderation” but when moderation veers towards excess, a detox is a great way to snap back into feeling like you. If you’ve been getting sick a ton or your skin looks like you’ve re-entered puberty, it may be a sign that your body is suffering because of your diet. Seasonal detoxing can be an incredible way to boost the immune system, brighten your complexion and make you, well, “regular” again. Feeling overwhelmed or out of control? A straightforward and easily-actionable detox plan can actually help you regain a feeling of balance when your life is anything but. When I worked in hospitality, December was always an insane time of increased workloads, heavy drinking, and copious amounts of small of fried food items being passed around like candy (along with plenty of actual candy and other sweets). After a couple Christmases of being stressed out, having acne, looking puffy and exhausted, and acting cranky (sorry, everyone), I realized that doing a detox from the Monday after Thanksgiving until the start of Christmas break would be extremely beneficial not only to my bod but to my psyche. Rather than feeling deprived passing up all the party favors, I felt powerful and self-aware. I could walk away from holiday party season ready to fully ENJOY and indulge during the holidays with my family — bring on the wine, the cookies, and the canapés. The fairly five excruciating days of my Sakara detox did exactly what I wanted them to do. It helped me reel myself back in so that on day six, a lightly-caffeinated matcha actually gave me a boost (whereas one week prior, I was mainlining double shot lattes) and on day seven, a glass of wine gave me a buzz (we won’t talk about my Cinco de Mayo alcohol consumption that proceeded said detox). As a bonus, my belly bloat had dissipated and that voice inside me screaming for more, more, MORE chocolate turned into a faint whisper. I actually haven’t had any chocolate *yet* but when I do, a small morsel is going to be satisfying AF. Rather than thinking of a detox as punishment for nutritional transgressions, think of it as a gift you give yourself. Maybe not quite as “treat yourself” as a Net-A-Porter splurge, but more like meditating when your mind is racing or foam rolling after a grueling workout. It’s painful while you’re doing it, and you’re often tempted not to do it at all, but you do it because you know how much better you’ll feel after you do — just like a workout. As I sit here sipping my first post-Detox glass of wine and feeling a nice buzz, I acknowledge that my diet will never be “perfect” nor do I want it to be. But what I do know, is that a well-timed and well-planned detox is a great way to show my body that I care about it… even if I do end up finishing this here bottle of Sauvignon Blanc. 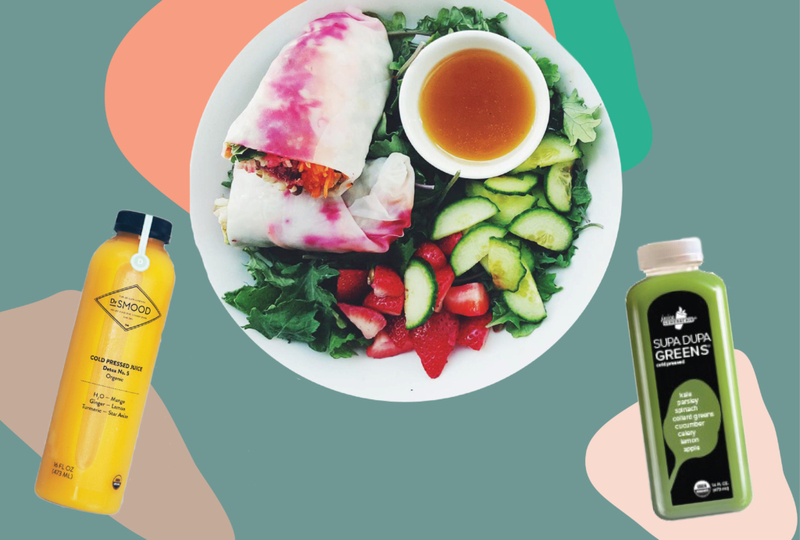 Thinking of trying a detox for yourself, use this code CHILLHOUSELOVE50 to get $50 off your first organic delivery meal service at Sakara Life.